Our research has taught us much about where and when to effectively manage predators. Much of life’s success is wrapped up in being at the right place at the right time. We’ve all been on fishing trips only to hear the locals say, “you shoulda been here yesterday.” The business of raising ducks on the breeding grounds is no different: there is a time and place for each tool we might employ to help our ducks thrive. Change is constant up here and sometimes prairie variation is natural (rain cycles), sometimes it is not (raccoons). One thing is for sure: the key to success in duck conservation is knowing when and where to apply tools like predator management. We’ve been actively studying predator management since 1993 in North Dakota and it would be an understatement to say we’ve learned a ton. Back in the early 90’s, we were trapping 16 square mile sites in North Dakota and commonly catching over 100 red foxes per site, per season. Today, in the same areas, we are typically catching fewer than 10 foxes per 36 square mile site per season. As the foxes have declined due to mange outbreaks, and the positive impact of the Conservation Reserve Program (CRP) has been experienced in most of our North Dakota study areas, nest success has increased from 15 percent to over 30 percent in these CRP-dominated areas. This has been good news for ducks and duck hunters over the last few years and we’ve all enjoyed the CRP-driven fall flights. At the recent North American Duck Symposium (NADS), a prestigious gathering of the continent’s leading duck researchers in Toronto, Delta students Courtney Amundson and Matt Pieron presented findings from the last several years of their research on predator management sites in North Dakota. It is abundantly clear through the work of Matt and Courtney that there is little benefit today to trap areas of North Dakota where there are large amounts of CRP grass and few fox. The ducks at these sites are nowadays doing quite well on their own. By the way, Matt and Courtney won the top award for an oral presentation by a graduate student for their work in evaluating the impact of predator management on breeding waterfowl in N.D. Congrats to both of them! We had the benefit at Delta of seeing where the students’ works was going a couple years ago so that we could do what we do best at our nimble, little organization: change quickly. This past summer, we did a small-scale test of predator management in a new area of eastern North Dakota with very little CRP grass cover for nesting hens to hide in. Guess what? Two trapped sites averaged 36 percent nest success while two un-trapped sites averaged just 4.9 percent. This is just one year of data so caution is required in interpreting these results. So what does this all mean for predator management in North Dakota? In all, if last year’s low-grass sites continue to produce promising results, we will feel that our 15 years of research in ND will have told us where and when to trap predators for nesting ducks: areas with low grass or pretty much anywhere when red foxes are abundant. This is why it is so essential to do the research and do it well. The only path to success is doing the science and following the results wherever they take you which is what we intend to carry on doing. The next huge frontier for predator management lies north of the border in prairie Canada. With over 50 years of decline in the potential for duck production and notable declines of the breeding populations of some species like mallards and pintails, prairie Canada is in need of some new approaches. In 2001 and 2002, Delta graduate student researcher Vance Lester showed quite clearly that predator management significantly improved nest success in the grasslands of southern Saskatchewan. However, a new student, John Dassow, tested predator management in the parkland region of Saskatchewan the past three summers and found that trapping did not consistently improve nest success within this vast region of the Canadian Prairie Pothole Region (PPR). There are many theories that we will test in the coming years within the parkland region of western Manitoba, near the town of Minnedosa. Only time and more research will tell. 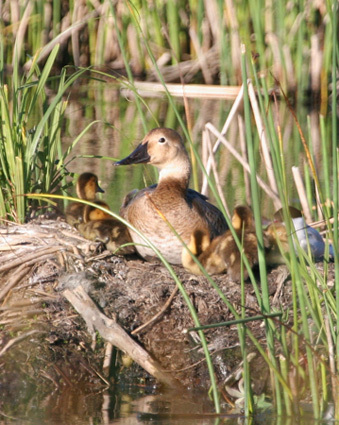 One thing is for sure, without trapping, nest success for ducks within our study sites located in the Canadian parkland have been consistently below 6 percent and often much lower than that. We cannot rely on the Dakotas, especially knowing that CRP appears to be in decline. With the commonly dismal hatch rates in much of prairie Canada, we need to understand if we can effectively control all those egg-eating predators. Look to our website and future issues of this magazine for an extensive and exhaustive discussion of this past summer’s predator management results and our plans for continuing this critical research next summer. Rob Olson is president of Delta Waterfowl. Reach him at rolson@deltawaterfowl.org. For more information: www.deltawaterfowl.org.